The other day I mentioned catching the Volck show at the National Portrait Gallery. The Confederate Sketches of Adalbert Volck exhibit is just one of many that the NPG is putting on during the sesquicentennial. Volck is in the same exhibit space as the recently ended Elmer Ellsworth show. Matthew Brady’s Photographs of Civil War Generals is going on through May 2015. What makes the Brady photographs so special and wonderful is that the images are contemporary prints made from the original glass-plate negatives from the Smithsonian collection. The level of detail is something you will not see online or in a book. 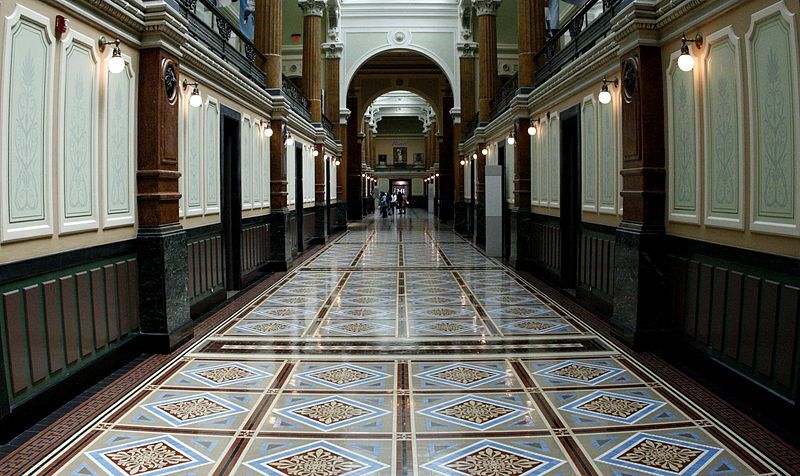 The Portrait Gallery is a unique place to learn about the Civil War because so much Civil War history took place there. Clara Barton worked in the Patent Office in the 1850s. Whitman served there during the war when the building was a hospital, and after when the Patent Office Building became the home of the Bureau of Indian Affairs. Lincoln’s second inaugural ball was held there in March 1865. Guests walked down the hallway shown above to meet the sixteenth president. If you are going to DC anytime soon you owe it to yourself to visit the NPS, especially for The Civil War and american Art show coming later this year. Here is some audio about the building and the war courtesy of the Gallery.